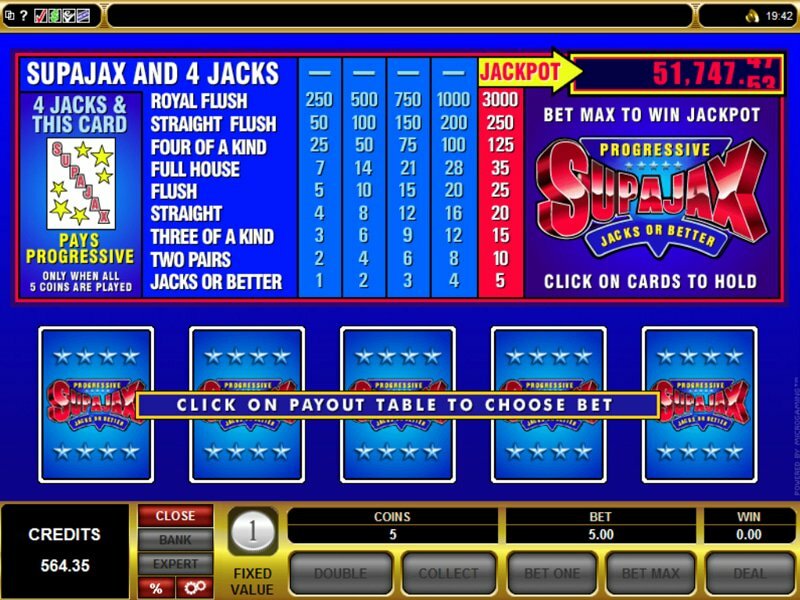 The Supajax progressive game from Microgaming is known to pay out some extremely high amounts with its large jackpot. This is one of the more unique video poker offerings and you will likely not see another option with pay table like this. The main variance of the Supajax progressive game and some of the other versions is that there is one more playing card in the deck. This card is not wild and only helps to form one winning payout, which is listed on the pay table. The hand that it helps with is the one that will win the progressive jackpot. Another unique thing about this version is the pay table itself. When five coins are played there is an additional winning combination that becomes activated. This combination is 4 jacks with the Supajax card. If this is dealt, the progressive jackpot is instantly won, as long as 5 coins were played. If less than 5 coins are played, the winnings will be for 4 of a kind only. When playing online at any of the sites powered by Microgaming it is important to note that there is a fixed coin value of $1. This amount will be in the currency that you have chosen to play with in your account at your online casino of choice, as most online sites offer multiple currencies. It is also possible to play free video poker if you want to simply learn more about the game before playing with real money. Everything else about the game is the same as found on standard video poker slots that offer jacks or better. This means that any hand that has a pair of jacks or above is a winning combination with a certain amount to be paid.